The last two titles I talked about on this site were rather dramatic and suspenseful series (Ten yori mo, Hoshi yori mo, and Yami no Purple Eye) so I thought I would relax a little and return to a modern fluffy cute collection of short stories. How is that for contrast? I picked this one up because the cover is adorable. There is all that pink, and the girl looks cute, and the guy looks wonderfully grumpy. I really liked him. He looks like my favorite type of shoujo manga hero — a surly guy. I like heroes that are gumpy and stubborn, but they end up relenting and being cute and caving in ^_^ And by surly, I don’t really mean that they should be mean, because cruel, abusive guys are not cool. I just mean that he is a bit more serious and in denial that they could possibly be falling for someone, until the truth hits them later on 🙂 Sort of a tsundere type, but again, not outright abusive. The type that will put up with a lot of silly behavior from the heroine (though it would be nice if the heroine isn’t dumb or too silly) with stoic resolve that he doesn’t quite understand himself. Anyway, he certainly looks grumpy, and I figured it would be fun to see his story. His story is the first of four short stories in this book. In this first story, we start things off great with yet another love confession scene. Our heroine, Keiko, is confessing to our hero, Kouga, that she loves him too! This brings a frown to Kouga’s face. What does she mean by “too?” Keiko says, “Well, you like me too, right?”. Ahh, this is news to Kouga, who in fact, does not like Keiko, and has no idea what she is talking about. He informs Keiko of her misconception, and she is amazed. But she takes the news rather well, and instead of freaking out, she remains quiet and thoughtful. Oh well, guess she made a mistake. However, when the pair return to class later, everyone congratulates them as a new couple! Oh no, Keiko’s over-confidence has made everyone else assume Kouga liked her too! Kouga is very surly and refuses to admit he likes Keiko. Meanwhile, Keiko is anxious to set everyone straight. She and Kouga are NOT a couple. It was her mistake! Story 2 is adorable. Asumi really likes a boy in her class, but she has always been too embarrassed to confess to him. Then one day, he announces that he and another girl in her class are now a couple! She did confess to him, and he accepted! Asumi feels awful, and can’t control her tears. She tries to hide at her desk and not let anyone notice her reaction to the boy’s announcement, but the boy, in his happiness, attempts to talk to Asumi. Asumi is about to panic, when a strange boy stands in front of her desk, blocking her from the other boy’s view. He makes an excuse for her that sends the others on their way, and saves Asumi from having to show her tear-stained face to them. Who is this boy who helped her? He is not in her class. She doesn’t recognize him at all! The next school year begins, and Asumi is surprised when she sees the boy who helped her before! He is in her new class, and his name is Yukiya! Before she really knows what she is doing, she approaches Yukiya and thanks him for helping her before. He made her really happy. In fact, she… likes him! The words of confession startle Asumi as much as they shock everyone around her. Unfortunately, Yukiya is not impressed, and rejects poor Asumi. But he doesn’t leave her totally without hope. He says if she can kiss him within 3 days, she can be his girlfriend. How mean! Asumi doesn’t know what to do, but she is not the type to give up! Will she bale to steal a kiss from the elusive Yukiya? In story 3, we have a young girl named Haruki who is ecstatic over receiving her first text message from the boy she likes. Yay! I think she attributes her success at catching his attention to the pads she put in her bra to make her chest look bigger ^_^;; That is pretty sad, lol. Just as Haruki is rejoicing in her room, an unfamiliar voice expresses his appreciation of her bra pads too. Ehhh?! Who is this tall boy and why is he in her bedroom! Turns out he is one of her childhood tormentors, her cousin Rei! Rei left for America 4 years ago, and has only just now returned. She never thought she would seem him again (and as far as she was concerned, it was good riddance) but now he is back, and he will be staying with her family! Haruki is so upset that Rei has returned! He was so mean to her as a child! But then Rei says something shocking — he came back because he loves her! No way, he can’t be serious, right? 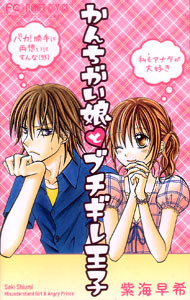 Next up, we have the story of Yumi, a girl who has just been asked out by Akiyoshi, the guy she likes, to go see a movie! She happily agrees, and can’t really believe it. Is this a DATE? She wants to think so, but how can it be? Akiyoshi already rejected Yumi’s love confession 6 months ago! Yumi bravely told him she liked him, and he had pushed her away! But their date, in spite of some awkward moments, goes very well, and Akiyoshi finally confesses to Yumi that he likes her too! To Yumi’s happiness, they become a couple, but how long will it last? Akiyoshi has some unexpected news to tall Yumi, which may make staying together difficult! Will they be able to overcome the obstacles in their path? All 4 stories in this volume are very cute, non smutty, and feature nice artwork. While there are occasional issues with really off body proportions, things manage to look okay most of the time. The guys are all adorable, even when they are being stupid, lol. I recommend this book for a fun, fast, read.